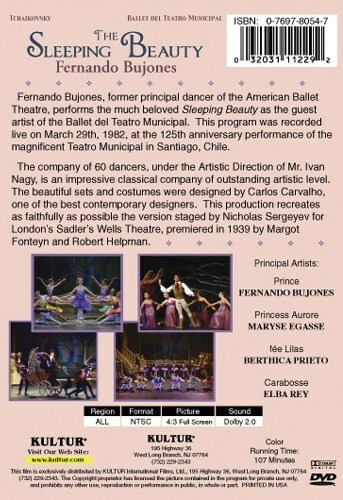 Fernando Bujones, principal dancer of the American Ballet Theatre, performs the much beloved Sleeping Beauty as the guest artist of the Ballet del Teatro Municipal. The program was recorded during a live performance March 29th, 1982, at the 125th anniversary performance of the magnificent Teatro Municipal in Santiago, Chile. The company of 60 dancers, under the Artistic Direction of Ivan Nagy, is an impressive classical company of outstanding artistic level. The beautiful sets and costumes were designed by Carlos Carvalho, one of the best contemporary designers. This production recreates as faithfully as possible the version staged by Nicholas Sergeyev for London’s Sadler’s Wells Theatre, premiered in 1939 by Margot Fonteyn and Robert Helpman. This DVD presentation was recorded in 1982 and is an exclusive presentation of Kultur in association with International Performing Artists, Inc.